Dr. Kennedy is a Consultant Hepatologist and Gastroenterologist. His work in viral liver disease is known internationally and he is widely published in the field. He has produced novel work redefining disease categorisation and investigating the role of individualised treatment strategies for chronic hepatitis B virus. In addition to multiple scientific publications in hepatitis B virus, he has written several book chapters in addition to editing a textbook; Hepatogastroenterology. His research focuses on translational aspects of viral liver disease and markers of disease progression. He is also leads a young adult clinical service at Barts and The London and has a special interest in liver disease in elite sports people. He has worked with premiership football clubs and has managed liver disease in professional athletes. 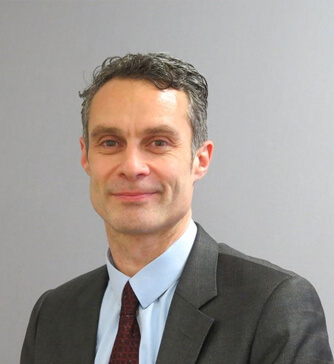 He is a member of the viral hepatitis clinical guideline committee for NICE and provides expert opinion for the United Kingdom Advisory Panel on blood-borne viruses. He is the Hepatology lead for the Gastroenterology and Hepatology Section at the Royal Society of Medicine. In addition, he is a key opinion leader in viral liver disease and a member of expert advisory panels for Gilead, Roche and BMS. He is regularly invited to chair and speak at national and international meetings. In keeping with Dr Kennedy’s longstanding research interest and publication record in viral liver disease, he is now the chief/principal investigator for a number of investigator-led and commercial phase 1, 2 and 3, clinical trials in HBV therapy.